OLLY - THE FIRST HOME ROBOT WITH PERSONALITY. YOUR ROBOT WITH AN EVOLVING PERSONALITY, AS UNIQUE AS YOU ARE. Your robot with an evolving personality, as unique as you are. Go to Indiegogo for further information and get your own! Olly is the first home robot with an evolving personality that adapts to each individual. 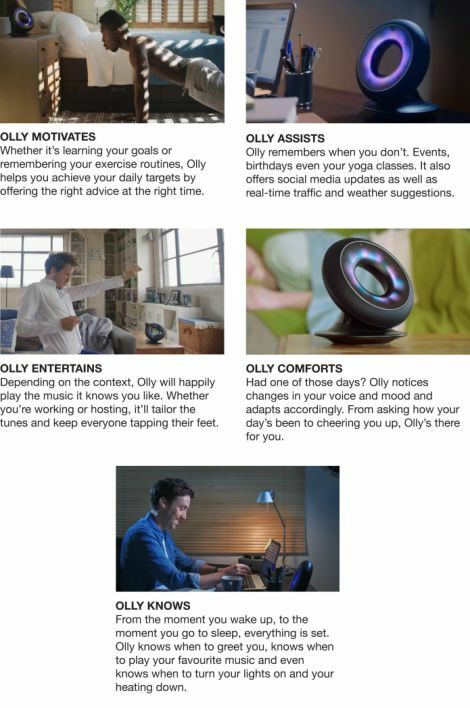 Designed to do more than just respond to commands, Olly’s advanced machine learning technology proactively assists you with your day-to-day routine by remembering your habits. Plus, Olly’s unique brain-inspired AI system – created by Emotech’s leading AI researchers and neuroscientists – creates a truly personalised experience by enabling Olly to understand emotion and adapt to the world around it. Why is Olly different? Olly learns SO You don’t have to ask. Proactivity* is one of Olly’s most unique features. Olly understands your patterns and schedules, processes the information based on context then acts on the information before you have to ask. Olly learns to be proactive in two ways: user defined and contextual awareness. *Don't worry, you have the full control. Olly will only be proactive under your permission. One way to teach Olly is to literally train Olly. For example, simply say "Hey Olly, tell me the weather in the morning." Olly will remember this and tell you the weather forecast automatically the next morning. You can train Olly to tell you the news, traffic, your calendar events etc. A ground-breaking AI engine allows each Olly to develop a unique personality, connecting with you on a highly personalised level. Based on your needs and personality, we do our best to match you with an Olly that will complement your lifestyle. No matter if you are an artist, a teacher, an engineer or an athlete there's an Olly for you. Olly understands your facial expressions, vocal intonations, and verbal patterns. So whether you are happy or sad, Olly sees it and hears it. This understanding allows Olly to move and talk to you in an unprecedented way. Olly interacts with people in a more natural way similar to how a person might. Olly does not only hear, but it can also see. Olly will proactively start a conversation rather than just reacting to a command.